Once upon a time, a baby girl was born into an average, middle-class family. To match her ordinary brown eyes, she had brown hair that, in the years to come, would never quite do what she wanted. She grew up in a small town where she had good friends and received a good education. Until . . . an ugly, sneaky, terrible monster crept in. Its attacks were silent and unseen. No one else knew it was there. It whispered atrocities in the girl’s ear . . . but not knowing where they came from, she believed them to be true. “You’re not very pretty,” it said. “You’re not that talented,” it whispered. “Your friends are smarter,” it taunted. “You should be thinner,” it suggested. The lies went on and on. Years went by, and the girl continued to be plagued by the treacherous deceits that the monster whispered in secret. No matter what she did, the voice was never satisfied. She bought pretty dresses to wear and clay for her face. She ran until she couldn’t breathe and ate so little that she often felt weak. She looked to other girls to learn how to be better—and then to boys to see if it worked. All her efforts were in vain, for the monster still whispered, still taunted, still lied. “Of course it’s true,” the monster hissed. But as time went on, the girl chose to ignore the voice—at first only sometimes, and then more and more often. The more she did it, the easier it became. And even though it was still there, the voice grew fainter . . . until some days she did not hear it at all. The best and most effective way to combat the monster is with the sword of truth. Today, the girl finishes her meals. She rejoices in her brown eyes and uncooperative brown hair. When the monster attempts to haunt her again, she pulls out the sword that she realized belonged to her all along: truth. With the truth about who she is, she beats the monster back into silence. There’s something mighty awful about being unhappy with who you are. It is a hopeless and devastating feeling when you see yourself as bad, unlovable, not enough. It can start with something as simple as gaining a couple pounds or seeing someone who has something you want. One second you feel carefree and content, the next you are wallowing in self-pity as you reflect on how completely inadequate you are. Where the voice—the monster—comes from, is hard to say. Our culture—the culture that tries to sell us innumerable beauty products, diets, expensive cars, and houses—feeds the monster. It is possible our family contributes, too—even if inadvertently. Very often, our parents have expectations for us that we don’t meet and hopes that remain unfulfilled. Sometimes their own wounds and demons haunt us, too. Regardless of how it comes about, the voice is a liar. The best and most effective way to combat the monster is with the sword of truth. You have a unique role and mission that no one else can fulfill. This purpose requires that you be you—the best you—and no one else. 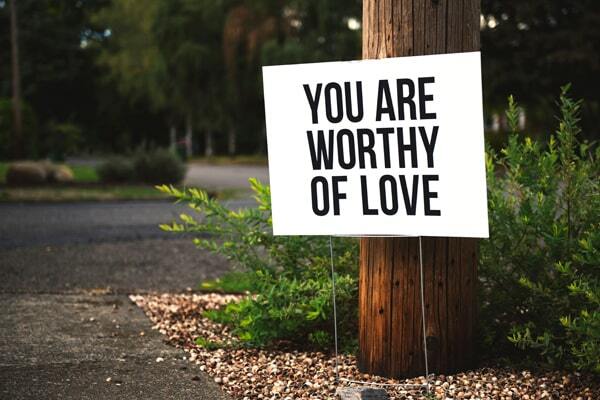 You are loved—just as you are, right now. What do we do with the truth? How do we embrace this reality about who we are? Forget everyone else, ignore the voice, and focus instead on being perfectly yourself. Sometimes (read: always) the tendency is for us to get stuck in our own heads, thinking about all the ways we fall short, all the problems we have, and all the ways other people ruin our lives. This inward focus causes quite a bit of unhappiness and dissatisfaction, effectively making everything worse. So, instead of spending an hour obsessing the next time you’re down on yourself or feeling insecure, reach out to a friend to see how they’re doing, send a funny message to a coworker, or think about a random act of kindness you can do for your roommate or spouse. You’re okay, life is good, and there is something bigger at work here. You can’t always control what you are exposed to. But to the extent that you can, it is a good idea to be wary of what you take in when it comes to social media, TV shows, and the people you spend a lot of time with. Definitely avoid social media when you are feeling down. Take note of which people you spend time with help you feel encouraged, and which people contribute to feelings of inadequacy or low energy. Even TV shows can be dangerous, as they often star stunningly beautiful people or lifestyles that are glamorous and unattainable. Be honest with yourself. If you feel a longing or dissatisfaction after watching a few episodes, give it up. Young children are pretty good at being okay with who they are. Generally, they don’t waste time wishing they were more successful, more outgoing, taller, thinner . . . they are too preoccupied with enjoying life. We can learn a lot from kids. Going somewhere that makes you feel small (by the ocean, on a hill, under a big tree) reminds you that you are just a tiny part of a big world and that whatever problem you have or feeling you’re experiencing, it isn’t the worst thing that’s ever happened. You’re okay, life is good, and there is something bigger at work here. You knew this was coming. It’s become cliché because it’s true. It’s really hard to feel good about yourself if you’re not practicing self-care. This makes sense because by not treating yourself well, you are communicating that you are not important or worth the effort. Whatever those little things are that bring you joy, embrace them. This looks different for everyone. If I run for twenty minutes a few times a week, I’m happy. Some people just need a daily walk, while others need to meet with a trainer. Some eat veggies every day, while I strive for a few times a week (I’m probably not the best person to look to for health advice). Regardless, it’s not about being the healthiest, most in shape person out there, it’s about treating yourself with the care and attention you would show toward someone you love. These are some of my favorite things. What are yours? It may seem inconsequential, but the things you love and that get you excited should be a big part of your life. They speak to who you are, and reveal deeper truths about yourself. One of the reasons I love beer is because I love to share carefree times with friends and family. One of the reasons I love donuts is because I love mornings and the start of a new day (plus they’re delicious). One of the reasons I love pretty dresses is because they speak to my feminine call to reveal beauty. Whatever those little things are that bring you joy, embrace them. They are a big and beautiful part of what makes you . . . you. The monster may still haunt you, but it doesn’t have to have the last word. The next time it rears its ugly head, try one of the five things listed above. You were made to be you, something no one else can possibly do (I’m starting to sound like Dr. Seuss . . . )—and that voice only gets in the way.